Capitalists@Work: Politics is lies - and no one cares. Politics is lies - and no one cares. This is a question for Bill, or perhaps a suggestion for a post; why aren’t political parties more answerable for the promises they make in the run up to elections? 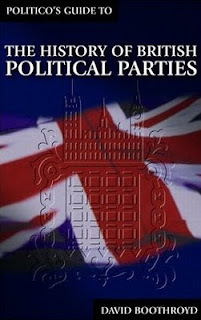 1} The lack of any choice in alternative parties similar to a voters beliefs, means voters remain committed to a party even when the party does the opposite of what the voter wants. So Cameron has had to admit to no Eu-referendum. The CWU union continues to fund Labour, despite Labour being committed to privatise them out of existence. But where can those unions go? Vote Tory? The Lib Dems won't win power for a decade or more even with the full support of all the unions. 2}Follows on that it is extremely difficult to create a new credible party in the UK, and even harder to gain any traction with it. At a time of unprecedented immigration the BNP are a fringe party. Even with Lisbon and EU law precedent, UKIP has got nowhere. There has been a Green agenda since the CFC scares of the 'caring' 90', for 20 years reaching almost religious belief today. Green MP's -Zero. 3} The media rarely revisit. Gordon Brown as chancellor announced free laptops for the poorest in his 1999 budget. Where are they? He felt confident to announce it again in 2008 and yet again just a few weeks ago as an election bribe, knowing no one questions it. Even on a supposedly hard hitting program like Newsnight or the Today show, a Politico knows that if they can just hold their nerve for 5 miutes its off to another topic. 24 hour rolling news. It just rolls on. 4} Politicians lie. They deny complete U-turns until everyone gets bored with talking about them. Look at Lisbon. Labour categorically deny that they have done anything different to their manifesto promise to hold a referendum on the constitution. They maintain that today. And the Tories can't really keep on about it as its a difficult area for them also. 5} And, voters don't really care. By that I mean millions marched against the Iraq war - years later just hundreds turned up to heckle Mr Blair at Chilcot. And a judge ruled that politicians can't be held to manifesto promises. Even ones printed on laminated cards and held up by John Prescott as some sort of success at every opportunity. Or it may simply be that the dancing show is on the telly and that's more important. There is some evidence in the polling of a government lying and not getting completely away with it. Labour have lost support from the middle classes for promising education/education/education yet kids can't read. Health service 'envy of the world', yet the dead pile up to meet targets. Students, unbelievably really, turn away from leftie causes when the economic cost of university lands on them. More 16-20's are polling for Dave than Gordon. But in the main Labour get a solid 30 -35% of votes whatever they do and the Tories a 30 - 38% and that is how its been for a long time. What happens when people disbelieve the garbage they are told is they don't vote at all. 80% turnouts now around 60%. It was a good email and a very valid question. Why don't politicians face real scrutiny ? So if you have any other reasons why we knowingly let the leaders get away with it please post them. 5) many truths are deeply uncomfortable / embarrassing / infra dig. There are things one might just about get away with in the comments column of a blog, that are 100% true, and at the same time could not be voiced by any mainstream politician. This being the case, why do we even expect truth from them ? I could go on ... but hey, it's Saturday morning ! I think really that it is short attention spans combined with the fact that most people are really, really stupid. As a Ukipper, I'd love to blame the FPTP system, but the standard of honesty in PR systems is no higher. There was an article by Peter Hain t'other day where he said people should vote Labour because, unlike the Tories, they have the 'jobs guarantee for all young people' which is a complete and utter lie because as we know there are more NEETs that ever, so either Labour have this guarantee and have failed miserably, or they have no such guarantee. But Labour voters don't care (and Tory voters are just as stupid, but I don't want this comment to get too long). I'm no fan of Browns' but the free laptops are reaching some people. Although the application process, like everything else to do with welfare benefits is ridiculously bureaucratic and overly complicated. The free laptop scheme is a microcosm of the issues costing the welfare state so much, repeated demands for letters of entitlement from other benefits agencies creating work for those agencies and going back and forth in that manner for weeks. The parent has to be competent enough to navigate the system, and care enough about their child's education (or flogging a 'free' laptop down the pub) to continue doing so. The one's who suffer are as always the most vulnerable and the very people most in need of such schemes. One thing about complaicancy - if you ignore politics and current affairs, it tends to just go away. On Nick's point #5, have a look at this US local government press release. My boss would love to be able to do this, but he can't. Nick Drew - a very good analysis. However I don't agree entirely with point 1. I think it better to say that _for some people_ the will to power is stronger than the will to truth. The most successful liars - like Tony Blair - 'side-step' their own will to truth by believing their own lie. Lying always hurts, but if you practice, it hurts less. And often the perceived hurt to the consequences of telling the truth exceeds the hurt of lying. This is why politicians lie more than most - they practice more and think they have more to lose. As far as they are concerned it is a choice of a) lie or, b) lose their job. And btw I care very much when politicians lie - but what can be done about it? Especially when the BBC and others are so useless at uncovering the truth, or even have their own political axe to grind(eg the BBC's ideological dedication to the EU and AGW). To be fair, there's been a fantastic disinformation campaign by the education system, universities and the BBC which has enabled the cultural revolution of the last 40-50 years. Britain under Attlee, say, was a socially conservative place. How it's all changed - from our rulers perspective, at least. Take crime and punishment - a subject on which most Brits have what I'd call more or less 'robust' views. Yet the criminal justice system is completely in the hands of people who've been educated like this. There's a great Larry Elliott quote : "Only counter-revolutionary defeatism could explain the failure of the masses to appreciate just how good life was under Labour....the voters greeted the litany of achievements with the same sort of world-weary cynicism characteristic of the Soviet populace under Brezhnev; they assumed the figures were meaningless and that the real beneficiaries of the extra spending were the bureaucrats. They were right on both counts." It's very true that the media rarely revisit and at the same time they block and obfuscate. Something that appeared to be true quite recently ( no more boom and bust - 45 mins before the missiles land ) looks like a complete lie now. We all tell white lies all the time, grey ones quite frequently and sometimes black ones. We let politicians get away with it because they are no worse than us for the most part - and most do not pretend to be. Outrage/ Disappointment when someone gets caught out / u-turns / flip flops / whatever depends on the gap between their public persona (the lady's not for turning) and their actual actions. They get in real trouble only when they present one set of values and act according to another very different set. Viz TB, the reason is that he came into office promising (or rather very strongly implying) that he would apply 'higher ethical standards'. Actually, I do not think that anyone ever caught him out in a barefaced lie. He is held in something between general distrust and contempt because he did not tell the truth. I dont think he will admit to understanding the difference, but most people do. When Alan Clarke was caught out (talking about being economic with the actualite), very few felt any great sense of outrage. So the degree of betrayal the public experiences depends on the gap between the public image and the actual outcome. If we all hold politicians in low esteem and they confirm that opinion, no-one will be surprised or upset. Not sure that we learnt too much that we didn't know already. But why do journalists allow it so easily? They can cross examin. Some do. No minister wants to face Paxman or Andrew Neil unprepared but that's about it. I like Peter Allen on 5 live 6 o'clock news because just occasinally, when some politician starts blurbling through a list of tractor stats he cuts then short with a "we have heard all the statistics but our texters don't believe them and frankly, neither do I." You've got it the wrong way round, Anon@9:30. We should not 'esteem' them until they deign to live up to our high expectations; they should behave better, then we could esteem them as a result. I agree with Bill (9.45), why is it acceptable for politicians to just churn out an answer to a different question when asked something? I don’t watch interviews with politicians anymore because it always seems like the interviewer is just trying to make the politician say something stupid/offensive to heighten the awareness of his show (much like what happened to that mum’s net after GB had his biscuit issues) and the politician is just trying to get through the 5 minute slot without saying anything worthwhile.